Potential use of living and non-living kefir grains (small, gelatinous white/yellow irregularly shaped masses consist of live bacteria and yeasts) on removal of reactive dye Remazol Navy RGB from aqueous solutions were investigated. Experiments were carried out under different process conditions in order to optimize and model the bioremoval processes. 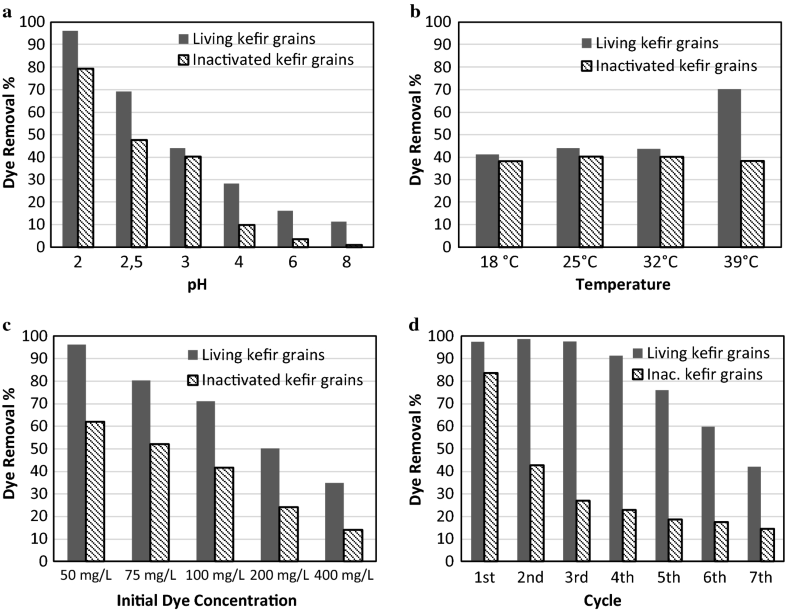 At all conditions the living kefir grains exhibited higher dye removal efficiencies than the non-living grains. In 180 min, 96.3% and 79.4% dye removal was obtained with living and non-leaving kefir grains respectively, at pH 2, 25 °C for 100 mg/L initial dye concentration by using 2.4 g/L kefir grain. Maximum adsorption capacities by living and inactivated kefir grains were obtained at 400 mg/L initial dye concentration as 134.59 and 56.92 mg/g respectively. Consecutive batch studies show that the living kefir grains could be reused over at least 5 cycles with high dye removal efficiency without any nutrition supplement. 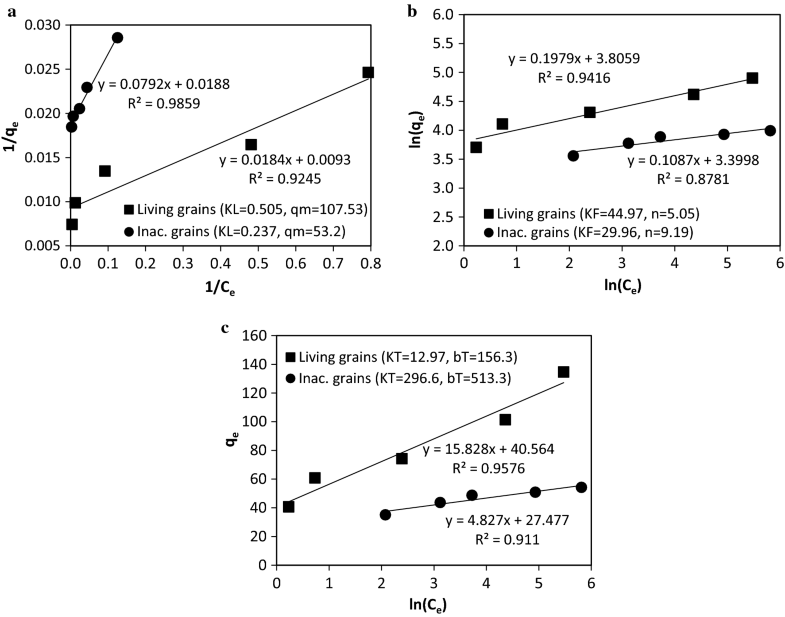 The biosorption kinetics both for living and non-living kefir grains were best described with pseudo-first-order kinetic model. On the other hand the biosorption equilibrium for living and non-living kefir grains were better defined by Temkin and Langmuir isotherm models respectively. Results suggest that the kefir grains could be used efficiently, eco-friendly and economically for removal of dyes from aqueous solutions. The online version of this article ( https://doi.org/10.1186/s13765-019-0429-1) contains supplementary material, which is available to authorized users. Dyes are synthetic chemical compounds widely used in dyestuff, textile, leather, paper, plastic, cosmetics, food and pharmaceutical industries. Worldwide production of dyes are approximately 700,000 tons/year and due to inefficiencies of the colouring processes most of the dyes are lost in the effluents of the mentioned industries. For instance, approximately 280,000 tons of the dyes are emitted annually from the textile industry [1, 2, 3]. The pollution by dyes leads to reduction of sunlight penetration in waters and decrease photosynthetic activity and dissolved oxygen concentration for aquatic life. Moreover, most of dyes and their breakdown products are toxic, carcinogenic, or allergenic [4, 5, 6]. Hence it is necessary to remove the dyes and their breakdown pollutants from wastewaters to safeguard the environment and living organisms. Several physical or chemical treatment processes have been used with varying degree of success for removal of dyes from wastewater. Recently, studies focused on microbial biomass as treatment by microorganisms is eco-friendly and cost effective [4, 7]. Several bacteria [2, 8, 9, 10, 11], yeast [12, 13, 14, 15, 16], algae [1, 4, 17, 18, 19] and fungi [6, 20, 21, 22, 23, 24, 25, 26, 27, 28, 29] have been used for dye removal from waste water and reported as potential bioadsorbents/biodegraders for toxic compounds. A summary of the most recent studies on reactive dye removal that performed with various microorganisms was presented in Table 1.
pH: 3–9 at 50 mg/L dye cons. Carbon source: maltose, sucrose, glucose, lactose at 40 °C, 50 mg/L dye cons. Nitrogen source: peptone, yeast extract, urea, ammonium chloride at 40 °C, 50 mg/L dye cons. 91.25% at 50 mg/L dye cons. 91% for RB19 and 100% for RB5 with Phlebia sp. 79% for RB19 and 91% for RB5 with Phlebia sp. The kefir grains (starter culture for the probiotic fermented milk drink kefir) are small, gelatinous white/yellow irregularly shaped masses consist of live bacteria (lactic acid bacteria of the genus Lactobacillus, Lactococcus, Leuconostoc and acetic acid bacteria) and yeasts (consist of Kluyveromyces, Candida, Saccharomyces and Pichia) in a slimy polysaccharide matrix and are responsible for lactic acid and alcoholic fermentation. Traditional production of kefir drink involves inoculation of milk with a variable amount of grains and fermentation at 20–25 °C for a period between 18 and 24 h [30, 31]. During the fermentation kefir grains increases and in a few day the amount get excess for a specified amount of beverage production and require to remove the excess amount in order to standardization of the product. For instance, the kefir biomass increase was reported as 1294% and 1226% for 10 day consecutive fermentation in 100 ml milk and whey respectively . Whey is a dairy liquid waste which is produced in large quantities throughout the world. Production of kefir-like whey beverages has been reported in several works. Hence whey can be used to produce kefir grains, so it can be converted to added value products while the kefir grains are produced cheaply [30, 32]. As a result, as a side product (or waste) the excess amount of kefir biomass obtained from milk or whey fermentation can be evaluated in different areas. As mentioned, potential use of many bacteria and yeast for removing the dyes from aqueous solutions have been investigated. Although kefir grains consist of several live bacteria and yeasts together, and could be easily produced with a very low cost or obtained as a waste from kefir-beverage industries, their potential use on dye removal has not been reported yet. Therefore in the present work the potential use of living and non-living kefir grains on the removal of reactive dye Remazol Navy RGB were investigated. Experiments were carried out under different process conditions to optimize the dye removal processes. The reuse potentials of the living and non-living grains were examined. Also modelling studies were performed to determine the most appropriate biosorption kinetic and isotherm models. Kefir grains, used as starter culture was obtained from Ege University, Faculty of Agriculture, Dairy Technology Department (Izmir/Turkey). The grains was grown in whey solution, at room temperature. Whey solution prepared to contain 5% lactose (as the milk which is the natural culturing medium consist of 5% lactose) by using whey powder which was obtained from Maybi Company, (Tekirdağ/Turkey). During the study the propagation medium was changed daily. In order to obtain non-living kefir grains, the bacteria and yeast in kefir grains were inactivated by thermal treatment with leaving the grains in an oven at 70 °C for 5 h.
Reactive dye Remazol Navy RGB was obtained from DyStar (Istanbul, Turkey). All other chemicals used were of analytical grade and obtained from Sigma-Aldrich (Istanbul, Turkey). Experiments were carried out in batch mode to investigate the effect of various parameters such as initial pH (2–8), temperature (18–39 °C) and initial dye concentration (50–400 mg/L). 100 ml working dye solution was heated up to the desired temperature and after the pH of the solution was adjusted (with 0.1 M HCl and 0.1 M NaOH solutions) the flask is kept in temperature controlled shaker. Then dye removal process is initiated by the addition of kefir grains. The shaking rate was kept constant at 120 rpm. During the treatments samples were taken from the solution at timed intervals to determine the residual dye concentration. 0.24 g kefir grains was added into 100 ml dye solution (initial dye concentration: 100 mg/L, initial pH = 2) in Erlenmayer flask and kept in temperature controlled shaker at 120 rpm and 25 °C. After 24 h treatment, dye concentration was measured and solution was discharged while used kefir grains were retained. New dye solution was added into the flask for next biosorption batch. Consecutively seven batches were carried out. Residual dye concentration was determined by analysis of samples absorbance using a UV–Vis spectrophotometer (Shimadzu UV-150-02). The absorbance of samples was measured at λmax of the dye which is 616 nm. The absorbance values were converted to the concentrations according to the calibration curve that constructed by preparing reactive dye samples in the concentration range from 0 to 100 mg/L and measuring their absorbance values at 616 nm. As a result of linear regression analysis, to convert the absorbance values to the concentrations the following equation was obtained with the coefficient of determination, R2 = 0.9998. A zetasizer (Malvern, ZS MPT2) was used to determine the zeta potential of kefir grains. After drying at 45 °C for 24 h, the kefir grains were grinded and dispersed in 10 ml water and insert in ZS MPT2. The auto titration was carried out with 0.025 M HCl, 0.25 M HCl and 0.25 M NaOH for 2–10 pH range by 0.5 step increases. Morphological properties of kefir grains before and after biosorption was evaluated by scanning electron microscopy (SEM, Zeiss EVO LS 10). For observations samples were coated with Pt after drying at 45 °C for 24 h.
In order to determine the kinetics of the dye removal processes the kinetic data obtained were analyzed using pseudo first order (Eq. 4), pseudo second order (Eq. 5), intraparticle diffusion (Eq. 6) and Elovich (Eq. 7) kinetic models. To further explore the mechanism of dye biosorption the experimental data were analysed by Langmuir (Eq. 8), Freundlih (Eq. 9) and Temkin (Eq. 10) isotherm models. The point of zero charge (PZC) or isoelectric point of adsorbent is the pH that cause a net zero charge on the adsorbent surface. The PZC of kefir grains is obtained as pH 4.46 by measuring zeta potentials at various pH levels (results are available as Additional file 1: Fig. S1). The effect of initial pH on removal of reactive dye Remazol Navy by living and inactivated kefir grains were presented in Fig. 1a. Maximum dye removal by living and inactivated kefir grains were obtained at pH 2 as 96.3% and 79.4% respectively. The removal of the dyes by living and inactivated grains drastically decreased to 11.38% and 1.03% as pH was increased to 8. Kefir is an acidic, viscous, lightly carbonated dairy beverage and it is known that the living kefir grains are stable in a wide pH range, since during the fermentation the pH of the milk decrease from 6.8 up to 3.3 . As the decrease in dye removal efficiency was also observed with non-living kefir grains it can be stated that these decrease is not related with the inactivation of the active microflora of kefir grains. This effect is related to the electrostatic interaction of the dye molecules with the adsorbent surface. The PZC of kefir grains was obtained as pH 4.46. Hence below pH 4.46 the surface of grains positively charged that was favourable for attracting the anionic dye. As the pH of the medium increases the number of positively charged sites decreases on the adsorbent surface that render the dye adsorption less favourable. Similar pH trends were reported for removal of Reactive Red 198 by Potamogeton crispus , Reactive Blue 49 by waste beer yeast , Reactive Blue 19 by Panus tigrinus  and Reactive Red 239, Reactive Black B, Direct Blue 85 by waste beer yeast . Higher dye removal percentages were obtained at all pH values with living kefir grains as compared with the inactivated ones. This result may be attributed to the active microflora of the living kefir. The effect of temperature on the biosorption of Remazol Navy by living and inactivated kefir grains were presented in Fig. 1b. A significant change on dye removal due to the temperature increase was not observed in temperature range 18–32 °C with living kefir grains. The percentage dye removal by living grains in this range were obtained appx. as 42%. But with a further increase on temperature from 32 to 39 °C, the percentage dye removal was significantly rise to 70%. On the other hand, the increase on temperature, from 32 to 39 °C, does not effect the efficiencies of the inactivated kefir grains and almost the same results were obtained at all temperatures examined. The different temperature trends obtained with living and inactivated grains support the idea the active microflora of the living kefir grains contributes to dye removal. Initial dye concentration is an important parameter in adsorption as the concentration difference is the driving force to overcome the mass transfer resistances between the solid and liquid phases. The effect of initial dye concentration on the biosorption was investigated in the range from 50 to 400 mg/L at pH 2 at 25 °C by using 1.2 g (dry weight)/L kefir grains. The results were presented in Fig. 1c. Percentage dye removal by living and inactivated grains decreased while the adsorption capacities increased as the initial dye concentration increased. The biosorption capacities by living and inactivated kefir grains respectively reached maximum values of 134.59 mg/g and 56.92 mg/g at 400 mg/L initial dye concentration. The biosorption capacity increased with the increase of dye concentration as the mass transfer driving force increased. The decrease in the percentage dye removal with increasing dye concentration might be caused by the saturation of the binding sites on the biomass surface. Figure 1d shows the results of consecutive batch biosorption processes of Remazol Navy by living and inactivated kefir grains. The dye removal efficiency of the living kefir grains for 4 cycles maintained at a high level (above 90%) and in subsequent 3 cycles decreased to 76.01, 59.73 and 42.02% while the efficiency of the inactivated grains decreased gradually in 3 cycles. At the end of the 7th cycle the living kefir grains were cultured and it was observed that they maintain their vitality and growth ability. 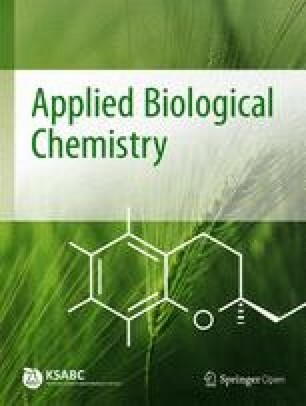 The results obtained from consecutive batch studies are promising since the experiments were carried out without any nutrition supplement for living kefir grains or regeneration for inactivated ones and indicate that the reusability of kefir grains can be improved and feasible for long term usage. The kinetic data obtained at different process conditions were presented in Fig. 2. Pseudo first order, pseudo second order, intraparticle diffusion and Elovich kinetic models were tested to determine the kinetics of the dye removal processes. The coefficient of determination (R2) is a measure of the degree of fit. The high values of the determination coefficients R2 (> 0.90) indicate a high degree of correlation between the experimental and model values. The experimental data (except for experiments carried out at pH 6 and pH 8 with inactivated kefir grains) showed well compatibility with the pseudo first order (0.93 < R2 < 0.99), pseudo second order (0.82 < R2 < 0.99) and Elovich kinetic (0.92 < R2 < 0.99) models but did not fit well to intraparticle diffusion model (0.69 < R2 < 0.99). However, as the obtained data for the models were evaluated as a whole for different experimental conditions, it was seen that the pseudo first order kinetic model provided the best fits (based on R2 values) among the three models. The plots of the first order kinetic model were shown on the Fig. 2 (the solid lines on the figures represents the model). The constants (pseudo first order rate constants, k1 and theoretical values of amount of dye removed per unit mass of kefir grains, qe) and statistical data (coefficient of determinations, R2 and standard deviations, s) obtained for the model were given in Table 2. The well compatibility of the experimental data with three models suggest that the biosorption of Remazol Navy by kefir grains are complex and may involve more than one mechanism. As a result of the highest compatibility of the experimental data with the pseudo-first-order kinetic model it could be concluded that the rate of occupation of sorption sites is proportional to the amount of available active sites on the kefir grains. Since the experimental data did not show well compatibility with the intraparticle diffusion model, the intraparticle diffusion is not the rate controlling step and the adsorption kinetics may be controlled by two or more steps. 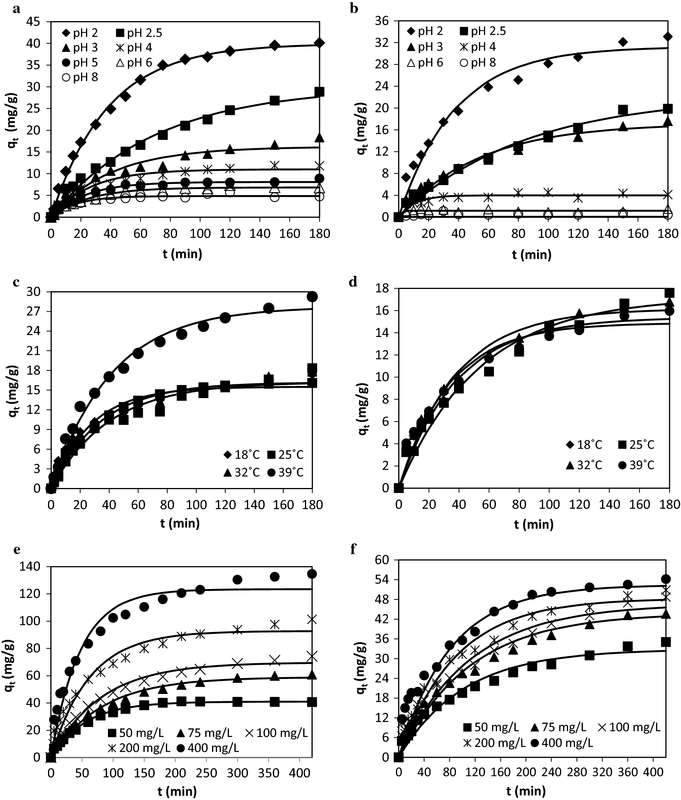 Further the compatibility of the experimental data with the Elovich kinetic model suggest that chemisorption might also be the controlling step during the biosorption processes. Adsorption isotherms investigate the interaction between the adsorbate and the adsorbent at equilibrium and help to understand the mechanism of the adsorption process. In the present study, the experimental data were modelled with the Langmuir, Freundlih and Temkin isotherms. The results were presented in Fig. 3. Although all models showed high compliance with the experimental data, based on R2 values it can be concluded that the biosorption of reactive dye onto living grains is better defined by Temkin model while its biosorption onto inactivated grains is better defined by the Langmuir model. The high compatibility of the experimental data with the Langmuir model suggested the occurrence of monolayer biosorption of reactive dye on homogeneous biomass surface. The determined KL values, fell within 0–1, indicates favourable adsorption of Remazol Navy onto the kefir grains. The Freundlih model also provided reasonably good fit with the experimental data suggested heterogeneous adsorbent surface. Since the experimental data showed well compatibility with both models it can be concluded that the surface of kefir grains are made up of homogenous and heterogeneous adsorption patches. The determined values of exponents, n, for the Freundlich model are between 1 and 10, indicating dyes were favourably adsorbed onto kefir grains. On the other hand the good representation of equilibrium data with the Temkin model suggested that adsorption heat of all molecules in the layer decreases linearly with coverage. The surface of the kefir grains was characterized by SEM before and after the biosorption. The SEM images were shown in Fig. 4. As seen from the images the surface of the kefir grains is rough and has macro and micro pores and after biosorption the surface of the grains became less rough since the reactive dye was diffused into pores and was completely covered the grain surface. The result of UV–Vis spectral scan of dye solutions before and after 180 min treatment with living and inactivated grains (results are available as Additional file 1: Fig. S2) showed that the main peak in visible region at 612 nm in untreated dye solution disappeared in living kefir grain treated solution and decreased in inactivated kefir grain treated solution. These results indicate the dye removal is mainly through biosorption. On the other hand the minor peak observed at 286 nm in untreated dye solution shift to 263 in living kefir treated one which indicates the decolourization may also include biodegradation. Kefir grains were used for dye removal for the first time in this study. Effects of various parameters on removal of reactive dye Remazol Navy by living and inactivated kefir grains were evaluated. The living kefir grains exhibited higher dye removal efficiencies compared with the inactivated grains. 96.3% dye removal was obtained with living grains in a relatively short contact time of 180 min. The results of consecutive batch biosorption processes show that the living kefir grains are reusable and their reusability can be improved further. Kefir grains offered great potential as an efficient, eco-friendly and cost effective adsorbent for the removal of dyes from aqueous solutions. The present results in this study will encourage the further studies of decolourization ability of kefir grains. DKA designed the study. AOE performed 90% of the experiments. DKA performed 10% of the experiments. Both authors analyzed the data. DKA wrote the manuscript. Both authors read and approved the final manuscript. Additional file 1: Fig. S1. Point of zero charge of kefir grains. Fig. S2. UV-Vis spectra of dye solutions before and after 180 minutes treatments.